Due to the ever increasing use of diverse microbial taxa in basic research and industrial settings, there is a growing need for genetic tools to alter the physiology of these organisms. In particular, there is a dearth of inducible expression systems available for bacteria outside commonly used γ-proteobacteria, such as Escherichia coli or Pseudomonas species. To this end, we have sought to develop a pair of inducible expression vectors for use in the α-proteobacterium Methylobacterium extorquens, a model methylotroph. We found that the P R promoter from rhizobial phage 16-3 was active in M. extorquens and engineered the promoter to be inducible by either p-isopropyl benzoate (cumate) or anhydrotetracycline. These hybrid promoters, P R/cmtO and P R/tetO , were found to have high levels of expression in M. extorquens with a regulatory range of 10-fold and 30-fold, respectively. Compared to an existing cumate-inducible (10-fold range), high-level expression system for M. extorquens, P R/cmtO and P R/tetO have 33% of the maximal activity but were able to repress gene expression 3 and 8-fold greater, respectively. Both promoters were observed to exhibit homogeneous, titratable activation dynamics rather than on-off, switch-like behavior. The utility of these promoters was further demonstrated by complementing loss of function of ftfL - essential for growth on methanol - where we show P R/tetO is capable of not only fully complementing function but also producing a conditional null phenotype. These promoters have been incorporated into a broad-host-range backbone allowing for potential use in a variety of bacterial hosts. We have developed two novel expression systems for use in M. extorquens. The expression range of these vectors should allow for increased ability to explore cellular physiology in M. extorquens. Further, the P R/tetO promoter is capable of producing conditional null phenotypes, previously unattainable in M. extorquens. As both expression systems rely on the use of membrane permeable inducers, we suspect these expression vectors will be useful for ectopic gene expression in numerous proteobacteria. As the amount of bacterial genome sequencing information continues to grow, the need for broad-host-range, extensible genetic tools will become increasingly ubiquitous. In particular, the capacity for heterologous gene expression in diverse microbial taxa will be of paramount importance for numerous research goals, as well as industrial and synthetic biological applications. To this end, we explored the use of two well-characterized transcriptional repressors (TetR and CymR) in conjunction with a phage-derived promoter (P R from phage 16-3) to produce a novel of set inducible expression vectors for use in the facultative methylotroph Methylobacterium extorquens. Methylotrophic bacteria are a ubiquitous group of microorganisms defined by their capacity to utilize reduced single-carbon (C1) compounds as a sole source of energy and biomass. The facultatively methylotrophic, α-proteobacterium Methylobacterium extorquens has been a model organism in the study of C1 metabolism for over 50 years. In the last decade, due in part to the development of a repertoire of genetic tools [1–4]Methylobacterium species have become increasingly useful in the study of horizontally transferred metabolic pathways [5–7] and microbial evolution [8–10]. Furthermore, in the past few years genome sequences have become available for eight representatives within Methylobacterium[11, 12]. While considerable progress has been made for genetic manipulation of M. extorquens, an area that remains underrepresented by comparison is the development of regulated expression systems. To date, only one regulated expression system has been demonstrated to be functional in M. extorquens. Choi and coworkers constructed an inducible expression system utilizing the cumate responsive transcriptional repressor, CymR, from Pseudomonas putida F1 and the strong P mxaF promoter that drives the expression of methanol dehydrogenase in M. extorquens. This hybrid system has been modified and utilized to test the fitness consequences of gene expression levels of different formaldehyde oxidation enzymes in Methylobacterium[14, 15]. While functional, this promoter-operator pairs are extremely “leaky”, wherein the basal level of expression in non-inducing conditions is quite high . This limitation makes heterologous gene expression exceedingly difficult, and hampers the exploration of conditionally null phenotypes. Building on these previous findings, we have employed an additional transcriptional repressor, TetR, from the transposon Tn10. As the foundational member of the TetR-family of DNA binding proteins , to whom CymR is also a member, TetR has been extensively studied yielding much data on ligand binding, DNA binding kinetics, and operator site specificity . In the absence of inducer, TetR and CymR bind tightly to their respective operator sites (see Figure 1), thereby inhibiting transcriptional initiation by RNA polymerase. Upon binding of ligands such as tetracycline or anhydrotetracycline (a high-affinity ligand) in the case of TetR, or cumate (p-isopropyl benzoate) with CymR, the affinity of TetR and CymR for their respective operator sites is nearly abolished, allowing for transcription initiation to proceed. Exploiting these characteristics, numerous studies have modified existing expression systems to behave in a dose-dependent manner. In fact, TetR and related transcriptional repressors have found use in numerous synthetic biology applications in bacteria, archaea, and eukaryotes [13, 18–23]. Map of expression vectors and sequences of P R/cmtO and P R/tetO . (A) Vectors maps of pLC290 (cumate inducible) and pLC291 (aTc inducible) expression vectors. The multiple cloning site contains a variety of common, single-cutting restriction sites. oriT: RP4/RK2 transfer origin. t rrnB : transcriptional terminator. trfA, oriV: RK2 (IncP) replication protein and origin. ColE1: High-copy replication origin for E. coli (B) Sequences for used for the P R/cmtO and P R/tetO hybrid promoters. Known RNA polymerase interaction sites (bold text) and engineered operators (underlined) are indicated. Here we describe the construction of two IncP-based, inducible expression vectors for use in M. extorquens, and possibly numerous other proteobacteria with minor modification. The novelty of these vectors lies in their use of two separate transcriptional repressors, TetR and CymR, along with a strong promoter from the rhizobial phage 16-3. We demonstrate the utility of these vectors by showing that i) induction is dose-dependent, ii) induction is continuous through time, and iii) the regulatory range of both systems exceeds those currently available for M. extorquens. Collectively, these results supply researchers investigating M. extorquens, and likely numerous other proteobacteria, with two alternative systems to express genes in traditional and synthetic biology applications. During the process of selecting an appropriate promoter, we desired that the promoter i) be sufficiently active in M. extorquens and ii) not be subject to regulation by native transcription factors. Based on these two criteria, a natural source for such a promoter was from bacteriophage. Many bacteriophage promoters have a wide host range and often have strong, constitutive activity in the absence of their transcriptional control mechanisms. However, numerous well characterized coliphage-derived promoters such as λ P L , λ P R , T5 P N 25, T7 P A 1 are weakly active or inactive in M. extorquens. To this end, we looked to other bacteriophage promoters that have been shown to be active in α-proteobacteria. Based on this metric, we explored the use of promoters from the control region of the rhizobial phage 16-3 (P L and P R ). Phage 16-3 has been extensively examined with physiological and biochemical studies in both its host, the α-proteobacterium Sinorhizobium meliloti, and Escherichia coli[24, 25], suggesting that P L and P R may be functional in a variety of hosts. Additionally, the only transcriptional regulator known to interact with P L and P R is the 16-3 C repressor . In a set of exploratory experiments, we found that P R was active in M. extorquens (data not shown). As we desired to construct inducible systems, we focused attention to engineering P R derivatives containing operator sites for the CymR and TetR regulators (Figure 1). The resulting hybrid promoters, P R/cmtO and P R/tetO , were found to produce the widest regulatory range without interfering with P R promoter activity. Interestingly, we found that placing the operators, specifically tetO, throughout other regions of the promoter resulted in either loss of promoter repression or activity (data not shown). This was a somewhat surprising result given the flexibility of many other phage-derived systems to be manipulated with multiple repressor and activator operator sites [18, 26]. Collectively, these findings allowed us to engineer two inducible promoters with similar maximal activity (Figure 2). Induction profiles of the P R/cmtO and P R/tetO promoters. Induction profiles of mCherry containing pLC290 and pLC291 derivatives (A) pJP18T and (B) pJP22T in M. extorquens PA1. Cell cultures were grown to mid-log phase and induced for 24 hrs prior to fluorescence measurements. Fluorescence units are presented as arbitrary units (A.U.) and normalized as described in Materials and Methods. A desirable property for regulated expression systems is for levels of gene expression from the promoter to be proportional to the concentration of inducer. In order to explore the range of induction of P R/cmtO and P R/tetO , the promoters along with their respective regulatory proteins were introduced onto broad-host-range plasmids (IncP compatibility group) to create the expression vectors pLC290 and pLC291 (Figure 1). Since previous studies have demonstrated mCherry to be a sensitive measure of gene expression in M. extorquens, we decided to use mCherry fluorescence as a metric of promoter activity. We placed the red-fluorescent protein variant mCherry under the control of each promoter in pLC290 and pLC291 and introduced the resulting vectors (pJP18T and pJP22T) into M. extorquens. To induce expression from P R/cmtO and P R/tetO , we supplied varied concentrations of cumate (Q) and anhydrotetracycline (aTc), respectively, to M. extorquens cultures. In general, both promoters were found to be responsive to concentrations of Q and aTc that were in agreement with previous studies in M. extorquens or other organisms [13, 18, 27]. The P R/cmtO promoter was observed to respond to a range of 0.1 to 5 µg/ml (0.6 to 30 µM) of Q and the P R/tetO promoter from 0.1 to 25 ng/ml (0.2 nM to 50 nM) aTc. Interestingly, the induction profile of P R/cmtO increased in a log-linear fashion over the entire concentration range, whereas P R/tetO was observed to have a much more concave profile. In terms of regulatory range, P R/cmtO and P R/tetO were observed to have 10-fold and 30-fold induction, respectively, with both promoters having the same maximum absolute levels of expression (Figure 2). Importantly, the basal level of expression from P R/cmtO was found to be approximately 3-fold higher than that of P R/tetO . Taken together, these data suggest that while P R/cmtO may be more tunable, P R/tetO serves as a superior expression system for genes requiring tight repression, such as cytotoxic proteins. Also, we found that there was minimal cross-talk between the CymR and TetR ligand specificity or promoter binding indicating these systems would work independent of one another (pJP18T: 4.6 Uninduced/4.2 with aTc; pJP22T: 1.0 Uninduced/1.1 with Q; Grown in succinate). Comparing the levels of gene expression and regulatory range of P R/cmtO and P R/tetO to the cumate inducible P mxaF promoter previously reported [13, 14], we found that in M. extorquens these promoters achieve 33% of the maximal activity of P mxaF (the strongest known Methylobacterium promoter) and provide a greater degree of repression. Specifically, a cumate-inducible P mxaF mCherry expression vector, pHC115m, yielded relative fluorescence values of 15.6 ± 1.5 (uninduced) to 157.1 ± 3.7 (induced). While this 10-fold regulatory range was similar to P R/cmtO , the minimal and maximal expression from P R/cmtO were both 3-fold lower. By comparison, P R/tetO , with a 30-fold regulatory range, was able to repress expression 8-fold lower than the P mxaF system with only a 3-fold difference in maximum expression. Collectively, these results demonstrate that both P R/cmtO and P R/tetO provide improvement over previously explored systems. However, we do note that P mxaF may remain a superior promoter in cases when high-level protein over-expression is desired. Importantly, these hybrid promoters allow for more relevant exploration of cellular physiology as their expression levels and ranges fall well within or above native promoters in M. extorquens. An issue with many expression systems designed with host-derived promoters is the possibility of interactions with native transcription factors. Specifically, the P mxaF promoter is known to be more highly active in cells grown on methanol as opposed to succinate [1, 28]. To explore this possibility, with respect to P R/cmtO and P R/tetO , we cultured M. extorquens harboring pJP18T and pJP22T in media with either methanol or succinate as the sole carbon source (Table 1). We found that succinate grown cells possessed a nearly 2-fold increase in maximal gene expression, compared to methanol grown cells; effectively, the opposite behavior seen with P mxaF . We suspect that this disparity in maximal expression may be due to an external factor, such as different plasmid copy numbers, between methanol and succinate growth. Previously reported XylE and β-galactosidase promoter probe vectors used in M. extorquens, such as pCM130 and pCM132 (plasmids with the same backbone as pLC290 and pLC291), exhibit between 2 and 3-fold increases in background activity during succinate versus methanol growth . As pCM130 and pCM132 possess no promoter sequences upstream of their reporter genes, the only likely variation that might exist is in plasmid copy number. Comparing these findings to our own, where P R/cmtO and P R/tetO contain no host-related transcription factor binding sites, we see similar fold changes in maximal expression suggesting that a similar mechanism may be affecting these expression systems. Taken together, these data indicate that single-copy or chromosomally integrated systems be used in situations where uniform expression is desired across substrates. Gene expression as measured by mCherry fluorescence from M. extorquens cells harboring pJP18T or pJP22T. Cells were grown in succinate or methanol medium in the presence or absence of Q (5 µg/ml) or aTc (25 ng/ml). Values are relative fluorescence (arbitrary units) and reported error is the 95% confidence interval (N = 4). A problematic feature of many expression systems, particularly those associated with metabolic pathways, is that gene expression can exhibit phenotypic heterogeneity throughout the population of cells, such as an on-off, switch-like behavior [29–31]. To explore this possibility, we grew M. extorquens strains bearing the mCherry expression vectors pJP18T and pJP22T to mid-log phase, induced cultures with either Q or aTc, and measured the time course of individual-cell fluorescence by flow cytometry. We found that over 8 hours of induction the induced populations activated transcription in a uniform, continuous manner (Figure 3). Though we did observe residual uninduced cells, we suspect this may be due to debris introduced by our cell fixing method or possibly cells losing mCherry due to costly over-expression. These data demonstrate the utility of the P R/cmtO and P R/tetO expression systems in studying aspects of cellular physiology requiring uniform gene expression. Single-cell dynamics of P R/cmtO and P R/tetO activation. Histograms of relative fluorescence values for pJP18T (A) and pJP22T (B) harboring M. extorquens PA1 as determined by single-cell flow cytometry. Cultures were grown to mid-log phase and induced with 5 µg/ml Q (A) or 25 ng/ml aTc (B). At times 0, 2, 4, 6, 8, and 24 hrs, cells were harvested and fixed in carbon-free Hypho medium supplemented with 100 mg/ml streptomycin. The 8 and 24 hr time points have nearly overlapping fluorescence distributions. Fluorescence units are presented as arbitrary units (A.U.) and normalized as described in Materials and Methods. To examine the utility of these vectors for studying M. extorquens physiology, we complemented a gene encoding a key enzyme in methanol metabolism using the P R/tetO -based plasmid pLC291. We chose to use utilize P R/tetO due to the tight induction properties we have observed using an mCherry reporter (Figure 2 and Table 1). The product of ftfL (formate-tetrahydrofolate ligase) is required for the assimilation of formate into biomass during one-carbon metabolism . A disruption in ftfL results in a methanol minus growth phenotype. By complementing a ftfL knockouts using ftfL–expressing vectors under the control of P R/tetO , in the presence of aTc, we found that we could fully restore growth on methanol (Figure 4). Importantly, in the absence of aTc, we observed that we were able to produce a complete null phenotype for ftfL (Figure 4). To date, no expression system for M. extorquens has been capable of producing conditional null phenotypes. These results demonstrate the utility of P R/tetO to study M. extorquens physiology and generate conditional null mutants regulated by aTc. To date, only a handful of expression systems exist for bacterial models outside E. coli and other closely related γ-proteobacteria. In an effort to expand the genetic toolkit available to researchers working with M. extorquens, and presumably other proteobacteria, we have constructed a set of two inducible expression vectors that utilize the CymR and TetR (cumate and tetracycline repressors) in conjunction with the strong P R promoter from phage 16-3. The pLC290 and pLC291 vectors were found to provide uniform, high-level expression in M. extorquens over a wide range of inducer concentrations. Importantly, compared to the only existing inducible system for M. extorquens, we found that P R/cmtO and P R/tetO have 3 and 8-fold increases in repression, respectively. This provides a significant improvement in the ability to explore M. extorquens cellular physiology. Further, as these promoters operate orthogonally to one another, we believe these expression systems will easily work in concert within a single strain to allow complex genetic engineering in a wider range of bacteria. For these reasons, we believe these vectors and promoter systems will be of great use to the bacteriological community in many research and industrial settings. The plasmid data supporting the results of this article are available in the AddGene repository with identification numbers http://www.addgene.org/44447/ and http://www.addgene.org/44448/. All bacterial strains used in this work are derivatives of Escherichia coli NEB10 β (New England Biolabs), E. coli LC100 (F−rph-1 ilvG att λ::[spcR lacI Q tetR]) , Methylobacterium extorquens PA1 strain CM2730 (Δ celABCD)  or M. extorquens AM1. 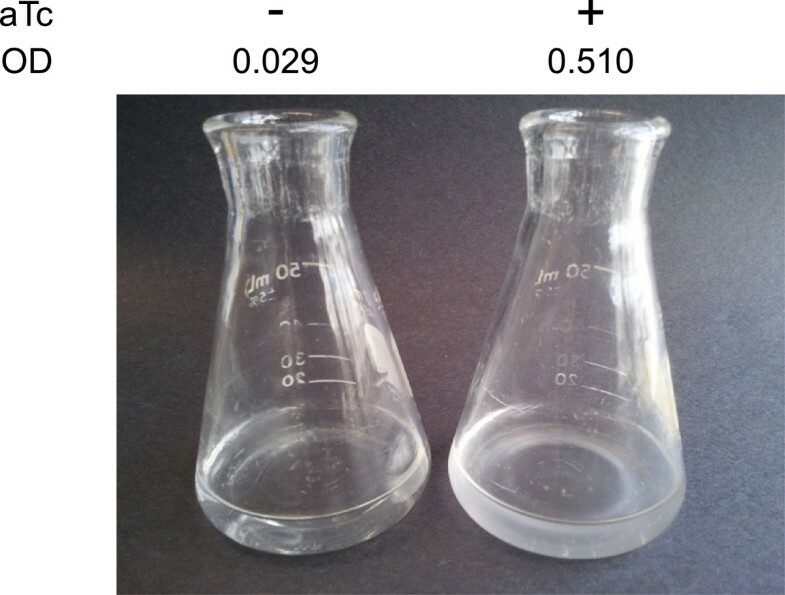 Growth of all strains, except E. coli, was performed in modified ’Hypho’ minimal medium as described by Chou and coworkers , with succinate at 5 mM or methanol at 20 mM. E. coli strains were cultured in Luria-Bertani broth as described by Miller  or nutrient broth. Media was supplemented with kanamycin at 50 µg/ml or ampicillin at 100 µg/ml to select for the presence of all plasmids. Inducers anhydrotetracycline (aTc) and cumate-KOH (Q) were supplied at 25 ng/ml or 5 µg/ml from aqueous stocks, respectively, unless otherwise indicated. Growth and gene expression experiments were performed at 30°C using an automated growth system described by Delaney and coworkers [34, 36]. Promoter designs were initially constructed and subsequently mutated in a pBluescript(SK-) (Stratagene) backbone. Synthetic oligonucleotides CAACAACTTATACC ATGGCCTACAAAAAGGCAAACAATGGTACTTGAC GACTCATCACAA and GTCCGTTCGTTACAATCTA CAACTACAATTGTTGTGATGAGTCGTCAAGTACC ATTG containing the sequence for a 91 nt region encoding the P R promoter from the rhizobial phage 16-3. The oligonucleotides were annealed to form a 91 bp dsDNA fragment, followed by PCR amplification with primers ATAGGGCCCCAACAACTTATACCATGGCC TAC and ATAGGTACCGTCCGTTCGTTACAATCTA CAAC to introduce Psp OMI and Kpn I restriction sites. The resulting fragment was digested with Psp OMI and Kpn I and cloned into the respective sites in pBluescript(SK-) to form pLC265. TetR and CymR operator sites (tetO and cmtO), were introduced at the distal end of P R in pLC265 using enzymatic inverse PCR (EI-PCR)  using primers ATACGTCTCATCCCTATCAGTGA TAGAGAGTTGTAGATTGTAACGAACGGAC, ATAC GTCTCAGGGACGTCAAGTACCATTGTTTGCC, AT ACGTCTCAACAAACAGACAATCTGGTCTGTTTGT GGTACCCAATTCGCCCTATAG, and ATACGTCTCA TTGTTTACAATCTACAACTACAATTGTTGTG fol- lowed by Bsm BI digestion and ligation to generate plasmids pLC271 (P R/tetO containing) and pLC277 (P R/cmtO containing). The subsequent broad-host-range vectors were constructed using the expression vector pHC115  as a template. A DNA region encoding Tn10 tetR was PCR amplified from LC100 using primers ATAGCT AGCAGGGAGAGACCCCGAATGATGTCTAGATTAG ATAAAAGTAAAGTG and ATAGGGCCCTTAAGACC CACTTTCACATTTAAG containing Nhe I and Psp OMI restriction sites. The resulting product was digested and ligated into the Nhe I and Psp OMI sites of pHC115, thereby replacing the cymR coding region with tetR to form pLC261. From pHC115 and pLC261, the P mxaF region was excised with Psp OMI and Kpn I and replaced with subcloned P R/cmtO and P R/tetO fragments from pLC277 and pLC271. To the resulting plasmids, a t r r n B terminator was PCR amplified from pHC01  using primers ACGCGAAATTCAAGCGC TAGGGCCAAGTTGGGTAACGCCAGGGTTTTCCC or ATGTGAAAGTGGGTCTTAAGGGCCAAGTTGG GTAACGCCAGGGTTTTCCC and TGTAGGCCAT GGTATAAGTTGTTGGGATGCAAAAACGAGGCTAG TTTACC and cloned into the Psp OMI site, using the method of Gibson and coworkers , to reduce transcriptional read-through into the P R/cmtO and P R/tetO promoter regions. Likewise a more comprehensive multiple cloning site was introduced into the Kpn I and Eco RI sites using annealed synthetic oligonucleotides GATAG GTACCTCTAGAAGATCTACGCGTACTAGTGCATG CGAGCTCACCGGTGAATTCATAG and CTATGAAT TCACCGGTGAGCTCGCATGCACTAGTACGCGTAG ATCTTCTAGAGGTACCTATC to produce the final expression vectors pLC290 and pLC291. The mCherry expression vectors pJP18T and pJP22T were created by subcloning a Kpn I and Eco RI digestion product containing mCherry from pHC115m  into the corresponding sites in pLC290 and pLC291, respectively. The vectors pLC290 (GenBank Accession KC296704) and pLC291 (GenBank Accession KC296705) are publically available from the non-profit organization AddGene.org (http://www.addgene.org/Christopher_Marx). Unmarked ftfL knockouts were generated by transforming the the Cre-recombinase expression plasmid pCM157  into M. extorquens AM1 derivatives CM216K.1  generating strain CM2336 (Δ ftfL::loxP). The ftfL omplementation vector was generated by subcloning a Kpn I and Eco RI digestion product of a pHC115-based ftfL plasmid (SMC unpublished) into the corresponding sites of pLC291, creating plasmids pSC54. 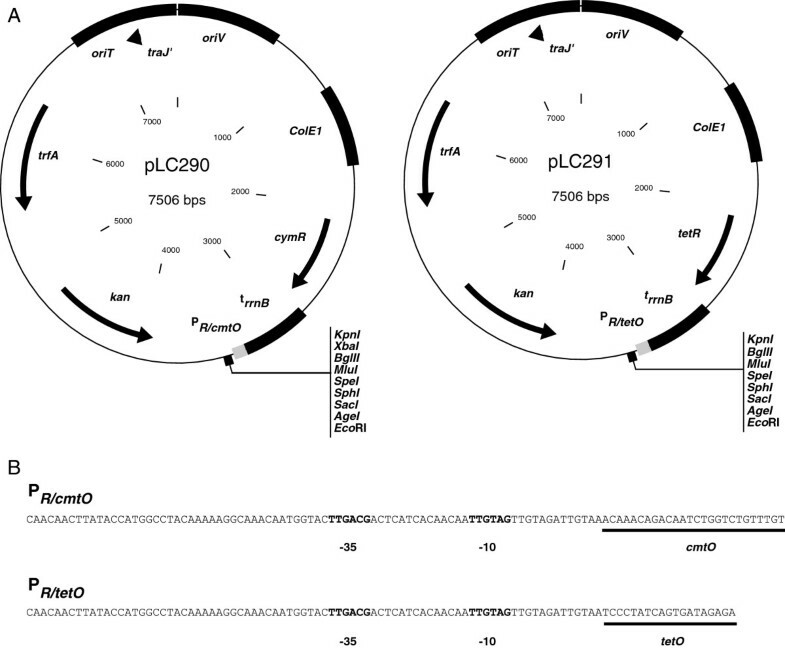 The vector, pSC54, was introduced into CM2336 via triparental mating using the helper plasmid pRK2073 [40, 41], to produce strains CM4103 (Δ ftfL::loxP/pSC54). Complementation was performed by inoculation of succinate grown CM4103 into methanol minimal medium containing 0 µg/ml or 20 µg/ml aTc. Dynamic expression assays were conducted under similar conditions as above with the following exceptions. Cells (200 µl of culture) were harvested after induction at 0, 2, 4, 6, 8, and 24 hrs. Culture samples were pelleted by centrifugation (6,000 xg) and resuspended in an equal volume of cold Hypho medium without succinate and supplemented with 100 mg/ml streptomycin to inhibit mCherry translation. Fixed cells were kept on ice prior to fluorescence measurements made using a BD LSR II Flow Cytometer. Flow cytometry data were then analyzed using the BioConductor flowCore package in R . Reported fluorescence values for flow cytometry are raw values from the BD LSR II and were not correlated to those of the Tecan Safire2. The authors would like to thank Dipti Nayak for testing preliminary versions of the vectors and Joshua Michener for helpful comments during the drafting of the manuscript. This work was supported by a grant from NIH (GM078209). The authors (LMC, JP, SMC and CJM) declare no competing interests with respect to the findings in this article. LMC and CJM were responsible for the conception and design of the study. LMC, JP, and SMC constructed all vectors and conducted all growth and fluorescence measurement experiments. LMC, SMC, and CJM drafted the manuscript. All authors read and approved the final manuscript.